Pancakes are for life, not just for Pancake Day. If you can't be bothered to make your own, here are some places that will do it for you any day of the year. It could be easy to sniff at My Old Dutch, with its bright orange frontage, tiny yet strangely comfortable wooden chairs and mock-Delftware plates. It is defiantly, sweetly, uncool. But the pancakes work. They are the sort you make at home – thicker than crepes, eggy and no buttermilk. You get just the one, but it is enormous enough to be satisfying without a distended stomach. We went for a sweet pancake and chose our own topping: banana, maple syrup and cinnamon. The smell is divine. We also like the way the bananas clearly went in the pan first, batter filling around them, so the undersides were slightly charred and caramelised. Vegan and gluten-free options too. My Old Dutch has branches in Holborn, Chelsea and Kensington. See website for details. 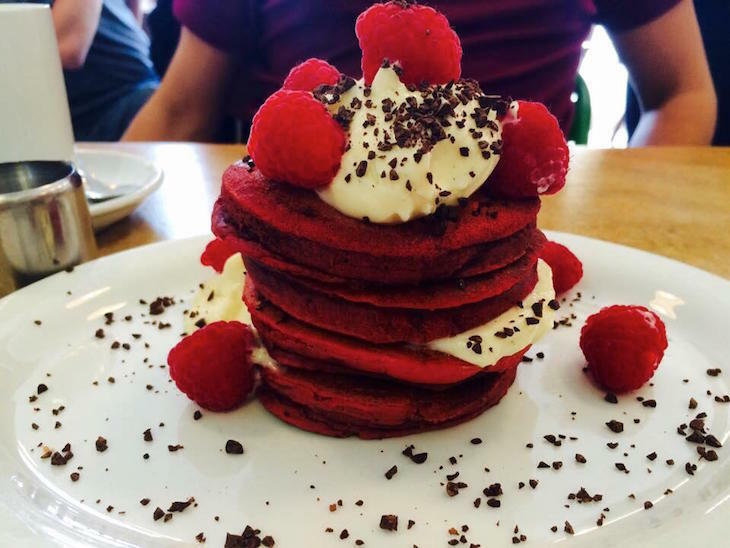 If you want your pancakes with a side of Instagram likes, Drunch is the place for you. 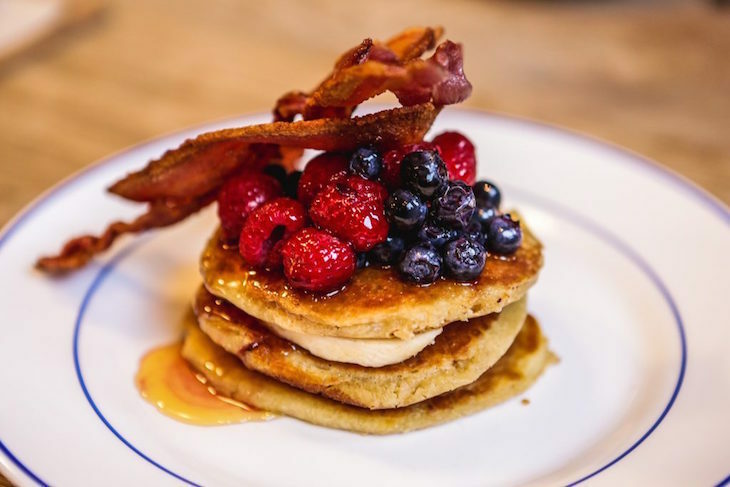 Situated just a 30-second walk from the madness of Oxford Street (with a second branch near Regent's Park), the pretty, upmarket cafe specialises in brunch, and serves up some of the best pancakes we've had in London. Thick, Scotch-style pancakes of impressive circumference are stacked up on your plate. You could opt for the banana and dulce de leche topping, but for our money, it's ricotta and berries every time. 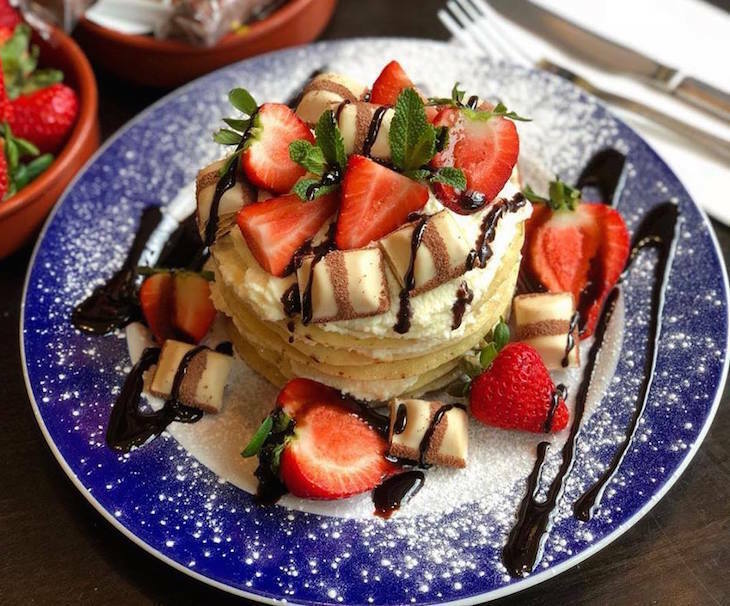 Very generous quantities of seasonal berries are beautifully presented, and perfectly complemented by the ricotta, topped off with icing sugar and just the right amount of syrup to keep sweet-toothed brunchers happy. Drunch, 1 Woodstock Street, Mayfair, and 38 St John's Wood Terrace. We first tried to visit The Breakfast Club's Soho joint on a Sunday morning. That was a stupid idea, as we saw the queue snaking down the street. So instead we headed to a branch down a tiny side street opposite Liverpool Street station (also the location of the secret Smeg fridge that gets you into a cocktail bar) on a Tuesday afternoon. Much quieter. They serve white flour buttermilk pancakes with bacon so crisp you could snap it in half, and on our visit they left us with the maple syrup bottle. (We can't guarantee that would happen at busier times.) For the ultimate comfort food combo, get a hot chocolate with mini marshmallows. 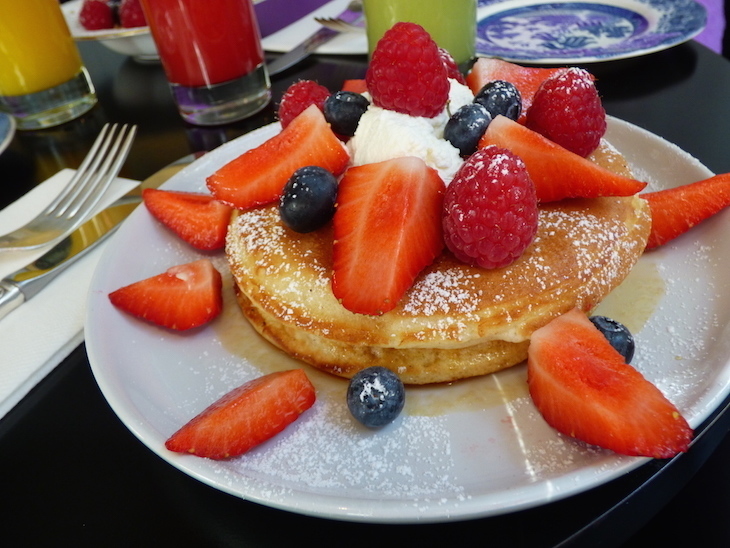 Healthy types (we use the term 'healthy' very loosely here) can opt for berry pancakes instead. The Breakfast Club has locations all over London. See website for details. We went for brunch at Bill Granger's Notting Hill outlet, and have just started salivating at memories of the honeycomb butter that accompanies its ricotta hotcakes. (Seriously, it's like Pavlov's dog around here.) You get three hotcakes, with maple syrup and a slab of banana. 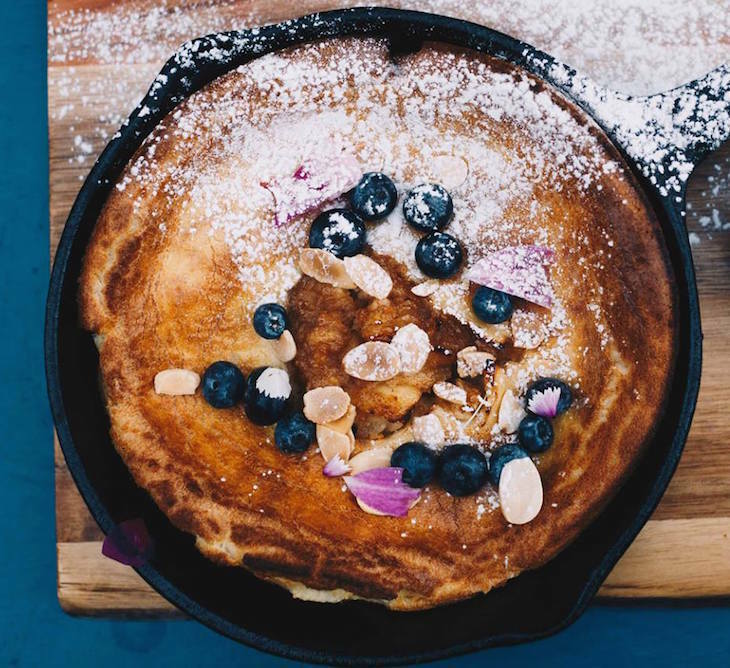 They are gorgeously fluffy and the ricotta gives a deliciously sour note to take the edge off the sweet, making them unlike any other pancakes we've found. The place gets very busy so don't be surprised if you have to wait. Granger & Co, locations in Notting Hill, King's Cross, Chelsea and Clerkenwell. See website for locations. Cutting swiftly to the chase, Where The Pancakes Are sells pancakes. No surprises there. 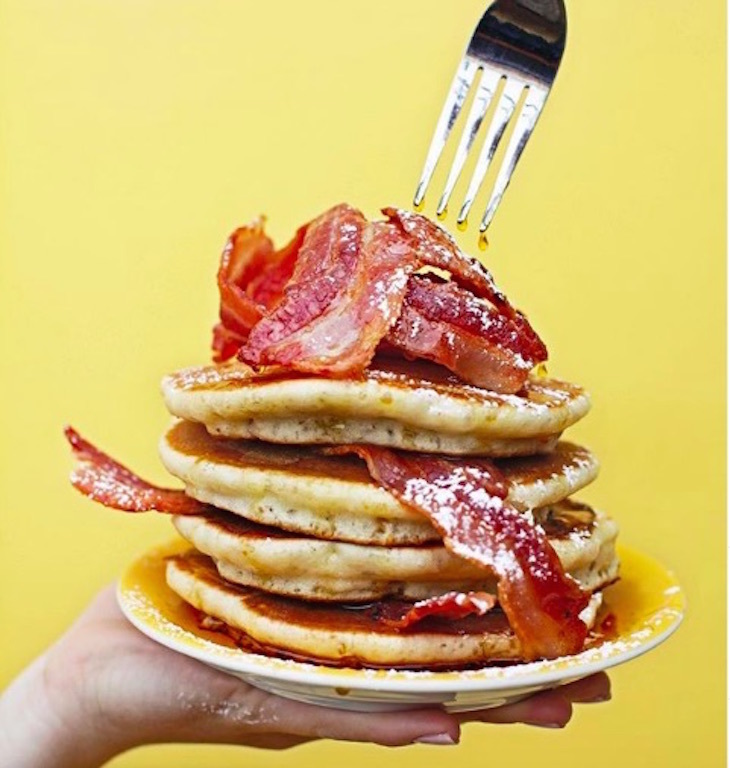 But the variety, size and quality of pancakes on offer may be a little more unexpected, says Londonist's Ruth Hargreaves. Breakfast pancakes, all day pancakes and evening pancakes. Buttermilk pancakes, vegan pancakes and Dutch baby pancakes (which sort of look like giant Yorkshire puddings). There's sweet, savoury and more added toppings than you can shake a whisk at. If you want to see the word 'pancake' so often that it completely loses all meaning, this is your best bet. 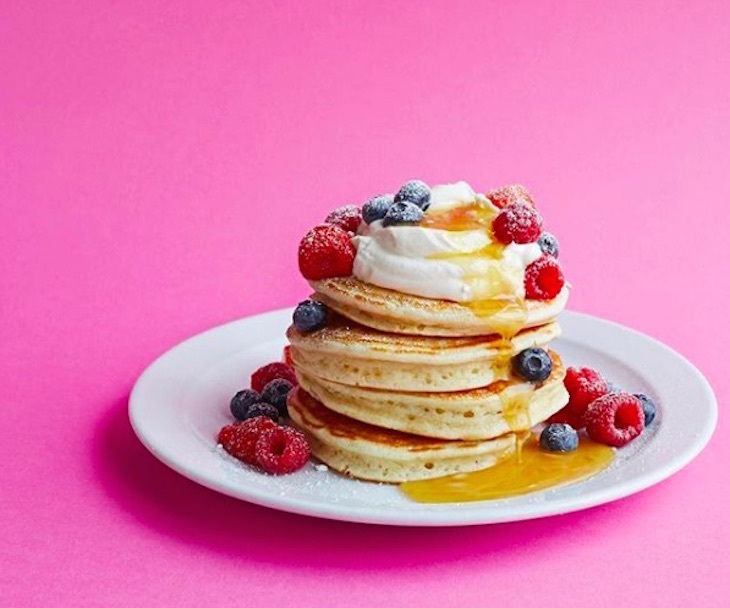 Where The Pancakes Are, Arch 35a, 85a Southwark Bridge Road, SE1 0NQ. It's straightforward buttermilk pancakes for breakfast at The Book Club: beautiful fluffy ones, with a slightly chewier texture than found elsewhere and none of that uncomfortable food-baby effect later. They come scattered with bananas, strawberries and blueberries, and no skimping on the maple syrup. Add bacon for extra if you like. With a homely chipped mug of Earl Grey and Erma Franklin over the speakers, this is the best start to the day we've had for a while. The Book Club, 100 Leonard Street, EC2A 4RH. 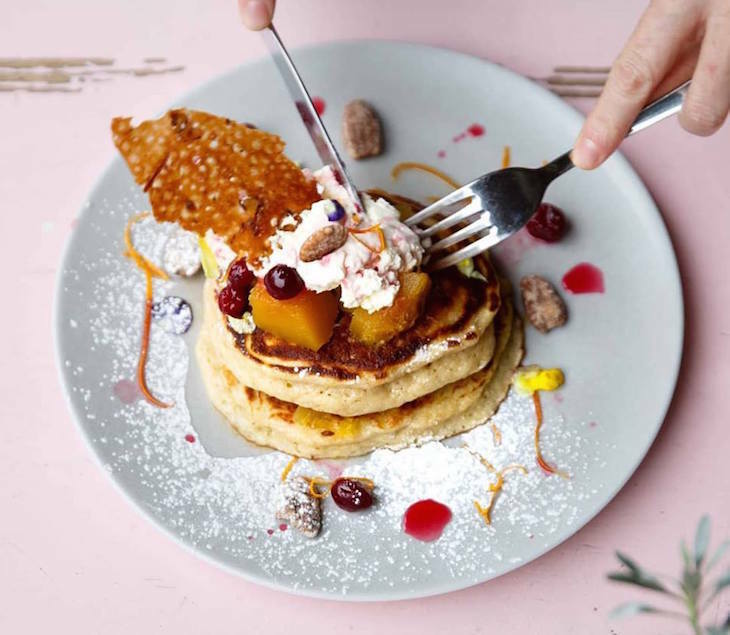 The fluffiest of pancakes await at this self-proclaimed "modern greasy spoon", located right next to Hackney Downs station. It's nothing more than an unassuming little cafe from the outside, says Londonist's Ruth Hargreaves, but there's nothing bashful about the all-day brunch offerings. 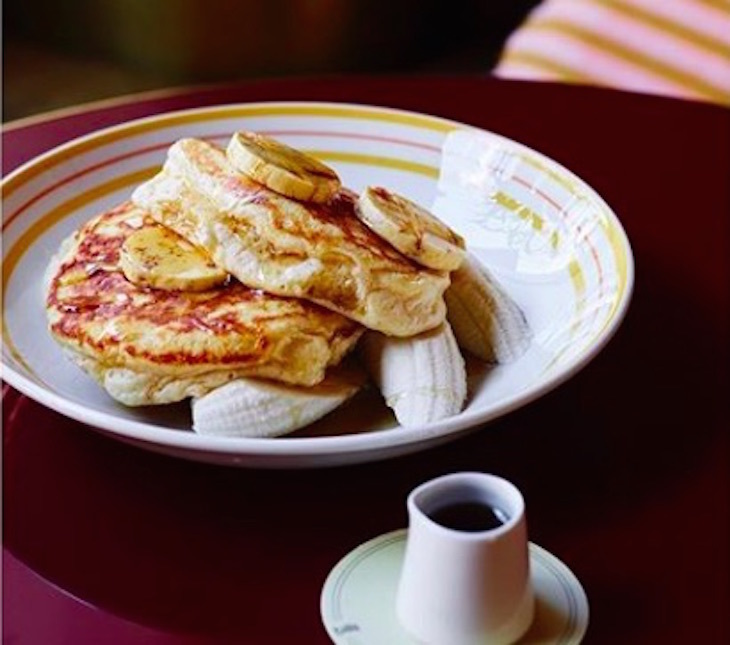 Yep, whatever the time of day, you can gorge yourself on this independent's trio of pancake offerings: buttermilk with maple syrup, blueberry with yoghurt, and white chocolate with caramelised banana. Soft, buttery and sweet, they're all a delight, but the chocolate pancakes are out-of-this-world good. Hash E8, 170 Dalston Lane, E8 1NG. Hipster gastronomy centre Brixton Village is where you'll find Senzala, and it's where you should head if you're vegan but still like the taste of pancake. 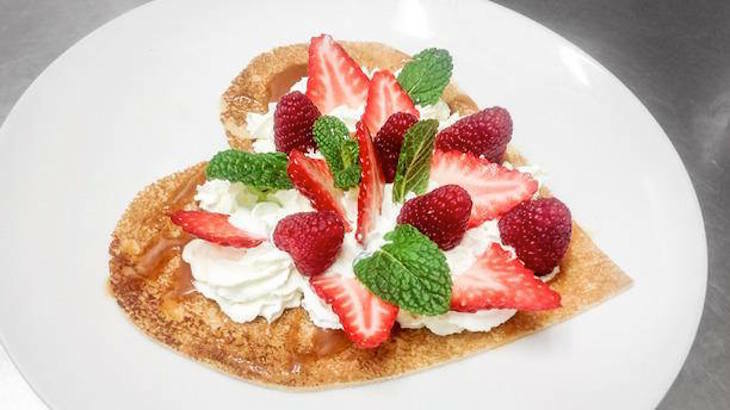 All Senzala's galettes (crepes made with buckwheat flour, which is also gluten-free) are vegan and there are several vegan savoury toppings available. 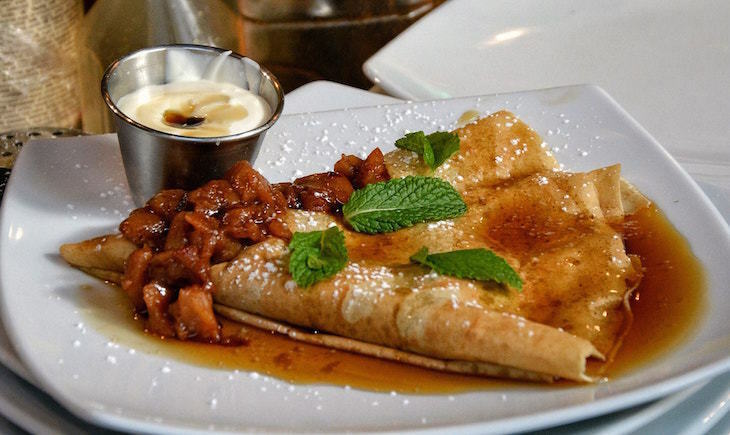 If you're in the mood for something sweet, just ask and they'll make a vegan crepe to order too. Being a tad hungover on our visit, we opted for a white crepe with caramelised apple, cinnamon, maple syrup and creme fraiche, the latter being a stroke of genius; a cool, slightly sharp zest to offset the lake of syrup the crepe swims in. And definitely recommended as a day-after restorative. Senzala Creperie, Brixton Village Market, 41-42 Coldharbour Lane, SW9 8PS. 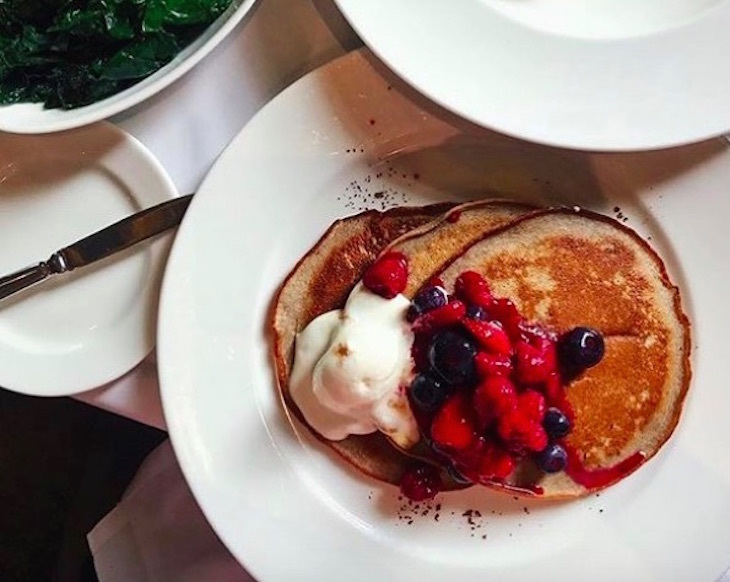 If you're the sort of person for whom brunch = pancakes, get yourself down to Christopher's in Covent Garden says Londonist writer Ruth Hargreaves. Of a weekend, their build-your-own pancake option keeps even the pickiest of pancake lovers in check. Buttermilk, blueberry buttermilk or buckwheat form the base of a dish that can be further laden with treats like maple-cured bacon, Nutella, matcha green tea, honeycomb, coconut sorbet and blueberry compote. It's a giddy experience which is slightly at odds with the upmarket surrounds, but any qualms about responsible food intake soon disappears when you order an additional brownie and bourbon milkshake. Everything about this Hammersmith creperie is French: the recipes, the decor, the music, the staff and the clientele. It's also another ideal venue for coeliacs as all the galettes are wheat- and gluten-free, and sweet crepes can be gluten-free if you ask. We opted for the most expensive thing on the menu: we cannot resist tartiflette, particularly not in such francophile surroundings. La Petite Bretagne, 12 Kingsland High Street, E8 2JP and 5-7 Beadon Road, W6 0EA.